As I mentioned in a previous post, nobody is completely a generalist or completely a specialist. Everyone falls somewhere along a continuous scale, with a little bit of each aspect in them. However, the Highlands Ability Battery is a career aptitude test that is exceptionally good at pinpointing where you stand on that scale, and your personal aptitudes for being a generalist or a specialist. It shows the way you naturally operate, which is especially helpful when it comes to finding a job you love and the ideal work environment in which you’ll thrive. A generalist (aka executive or delegator) loves to know a little bit about a lot of things. They take the “mile wide, inch deep” approach when it comes to knowledge about things. This is useful for being a director, delegator or executive manager. to know a lot about a very specific, small number of things. They take the “inch wide, mile deep” approach. This ability is critical for corporate contributors or industry experts. There are lots of other aspects wrapped up where you stand on the generalist/specialist aptitude test scale, too. For example, it helps understand how you respond to criticism, how you look at the world, how you pursue goals, how you explore subjects, how you best contribute at work, and how you advance in your career. It helps you to see what your ideal work environment is, and in what kind of situations you will find yourself doing your best work. 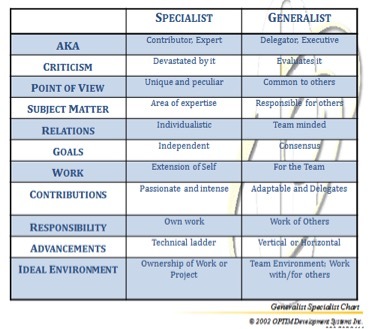 Look at the Generalist Specialist Chart for key work characteristics of the Executive versus the Expert or how you behave as a Contributor or Delegator. Wow, that’s a lot of information packed into just one ability. Indeed, and that’s what sets the Highlands Ability Battery apart from all other career assessments and aptitude tests. The Highlands Ability Battery will put into words the things you have always suspected and experienced. Your Highlands Ability Battery report will deliver you a personalized summary and description tailored to your unique results. It helps to put into words the things you have always suspected and experienced, but maybe never fully realized or examined. And, it provides so much more you never really knew about yourself. Chances are, you didn’t know that generalists tended toward executive and delegating roles and specialist sought to be contributors and experts in their field, or about the short list of work characteristics associated with this one aptitude. This ability test is extremely useful for finding a career in which you will thrive. Where you stand on the generalist/specialist scale has a lot of implications, which, if understood and fully grasped, will provide insightful and valuable knowledge and direction towards finding a job you love, adjusting your current position to take advantage of your assets, and ultimately succeeding in your career. This entry was posted in Ability Tests, Aptitude Tests, Best Career Tests, Career Ability Tests, Career Aptitude Tests, Career Tests, Career Tests General, College Career Testing, College Tips, College/High School, Test Name, Test Type, The Highlands Ability Battery (THAB), Uncategorized and tagged am i a generalist or specialist, am i an expert or executive, aptitudes, contributor, delegator, executive, expert, generalist, specialist, The Highlands Ability Battery (THAB), traits. Bookmark the permalink.